In this research guide you will learn how to get a COMPLETE, non-commercial, Statewide list of Assisted Living & Senior Living Facilities Provided by the State of Kentucky. Unfortunately, Kentucky is one of the most difficult states to research Assisted Living in. 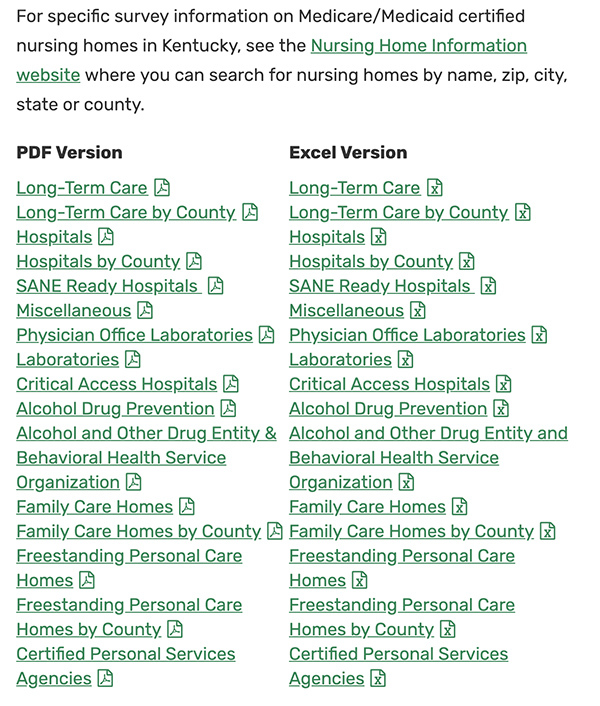 Most other states offer (to the public) ways for them to easily look up facilities (using State-sponsored data). Kentucky at least does this, for the most part. Where Kentucky falls behind is that they don’t (at the time of this writing) offer any way for the general public to look up/view inspections reports, complaints reports, or detailed history data for facilities. Most other states provide this through trusted State sources and websites. Providing a State-managed way to research Assisted Living is important, as it offers an alternative to the slew of questionable, ad-laden commercial sites that tend to dominate the internet. 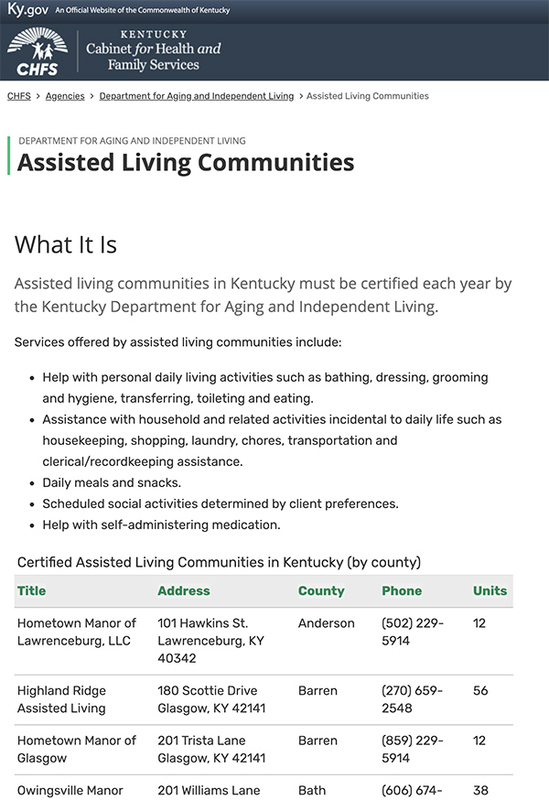 Method 1: You can get a complete list, by County, of Assisted Living Communities in Kentucky by visiting the Kentucky Cabinet for Health and Family Services, Department of Aging & Independent Living site. You’ll notice that the page begins with a Definition of Assisted Living Community in Kentucky. This is important, as “Assisted Living” services and definitions can vary greatly from state-to-state. 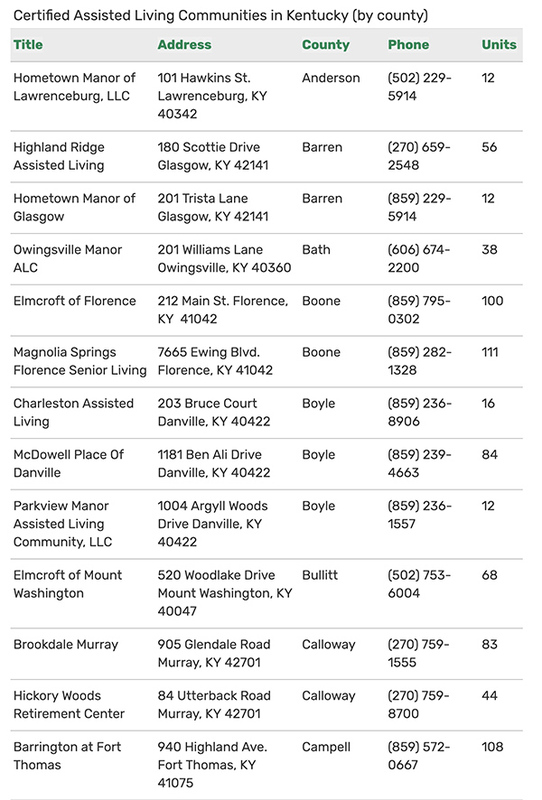 Assisted Living Communities in Kentucky are required to be Certified each year. This, again, is where Kentucky falls short. 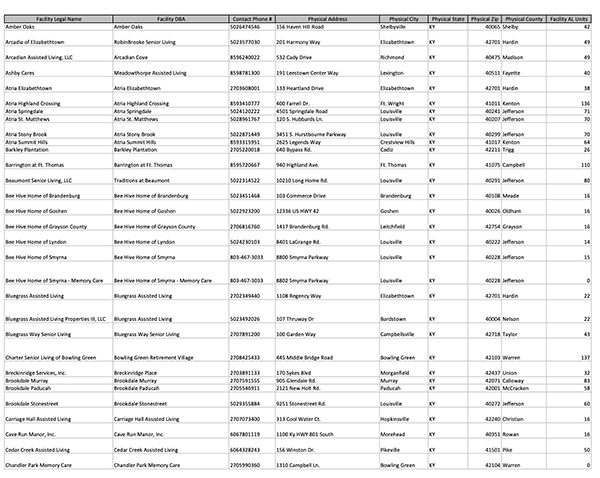 It’s a solid list, but it’s not really searchable, or interactive in any way. However, you can to a Keyboard search (CTRL + F) to search for a City or County that you are looking at. The Direct phone number is a big deal, since that is something that most commercial senior care sites omit. The one “interactive” feature with this list is that you can click on the green column titles at the top to sort the list alphabetically and in reverse. 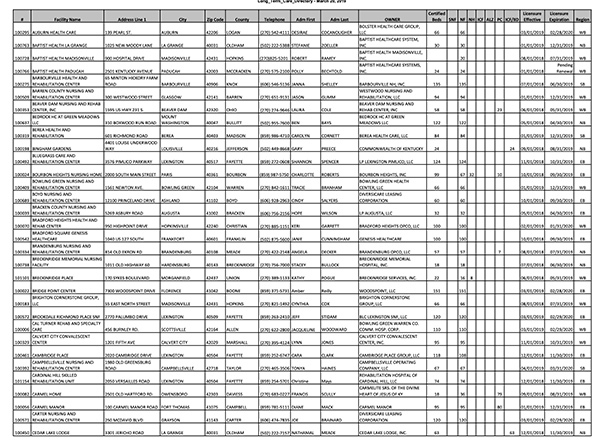 This list in .PDF format is useful for printing and saving. You can access this directory here. 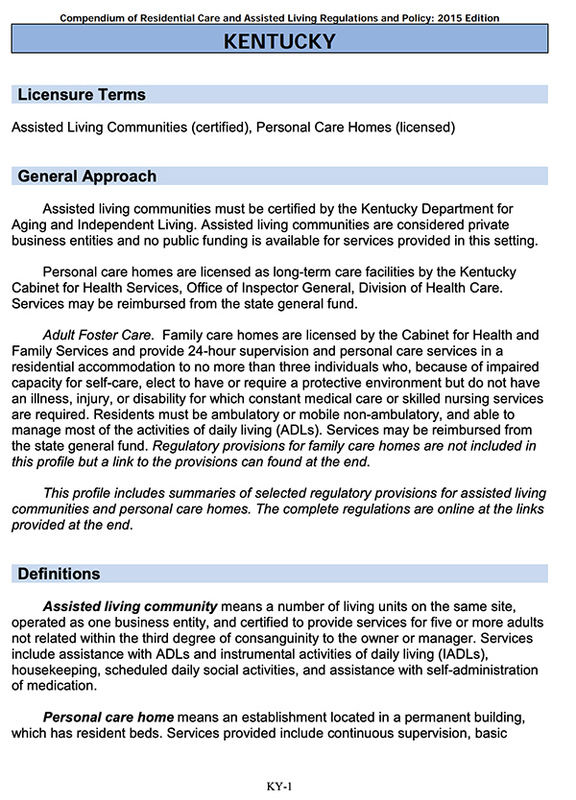 The State of Kentucky’s Office of the Assistant Secretary for Planning & Evaluation offers a .PDF summary, or ‘Compendium of Residential Care and Assisted Living Regulations and Policy‘ that is freely accessible to the public. These Rules, or Guidelines offer a great way for families and residents to understand the level, and quality of services they should expect through Kentucky’s Assisted Living Facilities & Personal Care Homes. To FILE A COMPLAINT against a licensed Long-Term or Health Care Facility or service in Kentucky (including Assisted Living & Personal Care Homes), please follow these guidelines.